What do you think Prince Charles gave his mother to celebrate the jubilee of her coronation? No, not a set of gold plated steak knives, a couple of corgi pups or a foot massage, but a nationwide network of meadows – a scheme to return a meadow to each county in England, Ireland, Scotland and Wales, and then encourage them to multiply. When I read this, my heart just soared. This ambitious project by HRH Prince of Wales aims to turn back the tide that has seen 7 million acres of flowery meadows lost in the UK in my lifetime. Britain now has 2% of it’s meadows remaining – the same scary figure of 2% that Australia has remaining of it’s once mighty rainforests. 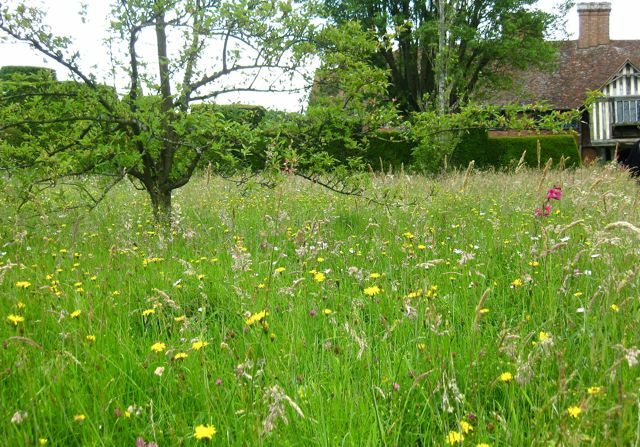 I started becoming interested in the whole thing about meadows when I visited Great Dixter, Sussex, last year – where the Lloyd family have been dedicated to creating wild meadows on their property for the past 100 years – bucking the trend at their wholesale destruction. My interest was also fueled by my sister-in-law and her husband who tried to create a meadow in their garden and failed dismally – they had been TOO diligent in caring for their soil. The secret to a successful meadow is that it has to GROW ON IMPOVERISHED SOIL- untreated and unfertilized, as old soils would be. Wildflowers and grasses are not adapted to ‘rich’ soils and will not flourish. Flowery and grassy secrets are not lost to us forever. Animals and insects attracted to these meadow plants do not die out either and help pollinate the plants around them. AND HERE’S SOMETHING UNEXPECTED TO GET YOU EVEN MORE EXCITED! What do you think folk in the country did with their livestock when they were sick, before the age of VETS? They put them in the hospital meadow – a patch of ground that was rarely grazed but left full of wild greens, grasses, herbs and other flowering plants – plants with medicinal and nutritional qualities that had the power to heal! -so said Oberon in A Midsummer Night’s Dream. I am sure that wherever you live in the world there is an unused lawn, an old sports field or a patch of waste ground, that is just waiting to be re-born! 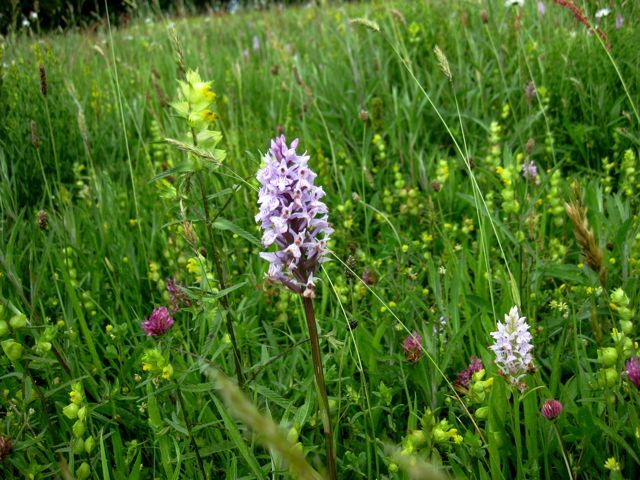 Do you have an orchard that you are forever mowing – let it go wild – slash it a couple of times a year and see what pops up and what a difference these wildflowers and grasses makes to the variety of birds, butterflies and insects they attract. Just don’t SPRAY with any pesticides, herbicides, feritilizers and agricultural chemicals – you could also help it along the way by broadcasting a special wildflower mix that you can get from a reputable seed supplier (Green Harvest/Eden Seeds/Diggers Seeds).The really serious meadow maker has a task ahead of them – the top few centimetres of soil have to be scraped off (this also gets rid of the exotic weeds and grasses) and then oversown with more friendly species native to the area. What a worthwhile project though – just think how beautiful it will be??!! And, just think of the butterflies??!! Anyone that knows me also knows that I am a bit of a fan of Prince Charles (and no, I don’t like the way he treated his wife, the late Princess Diana). However, he doesn’t have to stick his head up above the parapet to talk about important but, let’s face it, not very trendy issues like organic gardening, composting, sustainable housing, holistic health, multi-faith dialogues, architecture that feeds the soul etc. etc. – but he does. He could, like his forefathers before him, just spend his time hunting, shooting, fishing and fornicating – but no (well, maybe a bit!!) For example, he has spent the past 30 years at his home Highgrove recreating a meadow, where once there were acres of mown lawn, and making the whole place sustainable and if you want to see how he did it go to this short clip on YouTube and be inspired. It’ѕ a pity you don’t have a donate button! I’d definitely donate to this fantastic Ьlog! mү Facｅbook group. Talk soon!